Click photo to hear why Rep. Paul Thissen says Republicans favor corporations over kids. Debate over a Republican plan lower Minnesota state reserves to pay back schools brought DFL amendments to close corporate tax loopholes. The amendments never got put to a vote, but both sides got a chance to preview the rhetoric they will likely be using on the Fall campaign trail. 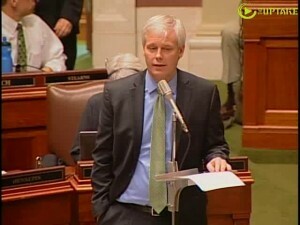 House Minority Leader Paul Thissen says Republicans are defending corporations at the expense of kids. Representative Pat Garofalo (R- Farmington) says the Democrats are selling phony baloney. Why is the Republican plan like a 1973 Dodge Dart? Representative Joe Atkins (DFL-Inver Grove Heights) compares the Representative Garofalo’s school shift plan to an old car he once had. Weddings often begin after the appointed time, but this one was almost too early: If Margaret Miles and Cathy ten Broeke pledged their troth before the big clock on the Minneapolis City Hall tower struck Midnight, it wouldn't count. Arrests are made as the Poor People's Campaign, founded 50 years ago by Rev. Dr. Martin Luther King Jr., protest a bill that would prevent local governments from raising the minimum wage.